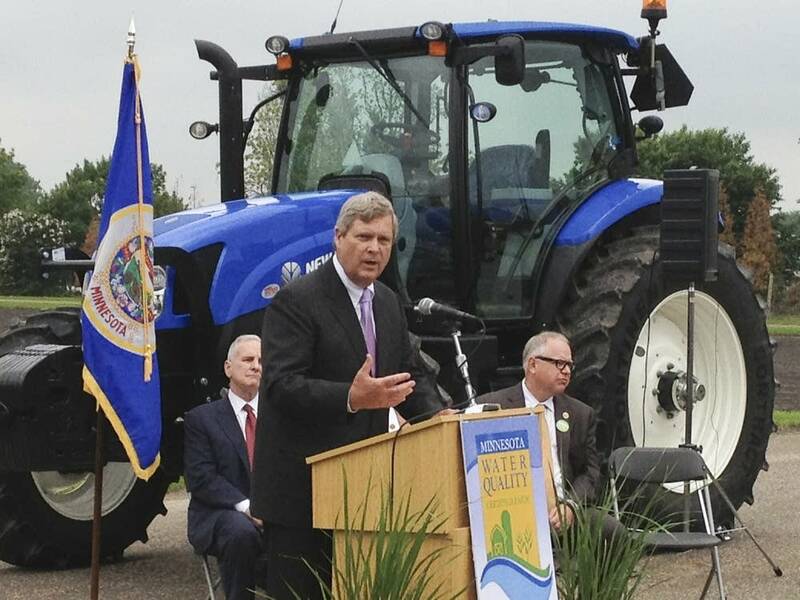 U.S. Agriculture Secretary Tom Vilsack on Monday said he hopes Minnesota's new water quality program for farmers will become a model for other parts of the country. The Minnesota Agricultural Water Quality Certification program is receiving $6.5 million in federal funds, plus $3 million from the state's Legacy Amendment to start the program in four watersheds that touch parts of nine counties: Olmsted, Wabasha, Winona, Stearns, Jackson, Martin, Faribault, Wilkin and Otter Tail. The pilot stems from an agreement in January 2012 between state and federal officials. Farmers adopt certain best management practices to minimize water pollution to be certified through the program. In exchange, the farmers are exempt from any new regulations for a 10-year period. The funding pays for experts to work with individual farms to determine what changes should be made and provides funds to implement those changes, Wohlman said. Vilsack described the program as a "new approach to regulation." He said the program gives farmers certainty — for 10 years, they don't have to worry about changing requirements as long as they've taken certain steps on their farms to lessen their operations' impacts on water quality. "It gives folks an understanding of precisely what best practices are in terms of conservation. It gives them the resource from the state and federal government to invest in those best practices, and most importantly of all, it gives them the assurance that once they have done that, they'll be certified by the state to be in compliance so there won't be someone coming a year or two years later saying, 'hey, now you gotta do something different,' " Vilsack said. Vilsack, a former Iowa governor, said he hopes the program will expand to more Minnesota watersheds and eventually to other states like Iowa and Missouri. Officials will be able to determine whether the program is working by judging whether surrounding lakes, rivers and streams are cleaner, he said. It's still uncertain what benchmarks Minnesota farmers will have to meet to become certified, said Kris Sigford, water quality program director at the Minnesota Center for Environmental Advocacy. "That's a big upcoming challenge," said Sigford, a member of the advisory committee that's been working on the program's details. Sigford was among some environmental advocates who questioned the 10-year exemption period for farmers as being too long. She said the 10-year period was a compromise that she's hopeful will work as long as the program's requirements are strict enough, especially for nitrate pollution from fertilizers, which is responsible for the dead zone in the Gulf of Mexico. "If we don't do a good job on this conservation measurement tool, then we're not going to be able to address nitrate pollution for 10 years at least," she said. Representatives from the four chosen watersheds — Whitewater River, Middle Sauk River, Elm Creek and Whiskey Creek — were on hand for the program's launch, which took place at a news conference on the University of Minnesota's St. Paul campus. Gov. Mark Dayton and three members of Minnesota's congressional delegation spoke at the announcement.